Greetings tall my brothers and sisters here on the forum! Recently, I've had the good fortune to meet Shane, the gentleman behind Blackland Razors, and the upcoming Blackbird Razor. I found out through this forum that he recently moved to my hometown, and I jumped at the opportunity to meet someone who shares my passion for wet shaving. I will say up-front and un-ambiguously that Shane did not even hint that he wanted me to post anything about the Blackbird. We have had a couple nice lunches together, (I paid for all of my food) and un-prompted, he brought a prototype along with him to loan me, just to try out. I have a fully paid pre-order into Blackbird, and I'll be waiting until they ship, just like everyone else. (Although I might drive to his house and pick mine up, so I don't have to wait an extra day for shipping. ) Other than making a new friend, and getting to try out a cool new razor, I did not get any sort of compensation for doing a write-up. I did ask Shane for his permission to post something, and I told him before taking the razor on loan that if I did a write-up, it would be fair, objective, and honest. He has confidence in his product, and did not hesitate to agree. Here is the head next to a BBS-1, for size comparison. Sorry, most of the pictures in this preview will be poor quality. I was running out the door to get Shane his razor back, and I took them hastily with my phone. I only just realized that the closeups still have whiskers on them! (How embarassing...) However, they should get the general ideas across. Here are the two handles, next to a BBS-1 and Wolfman, for size comparison. 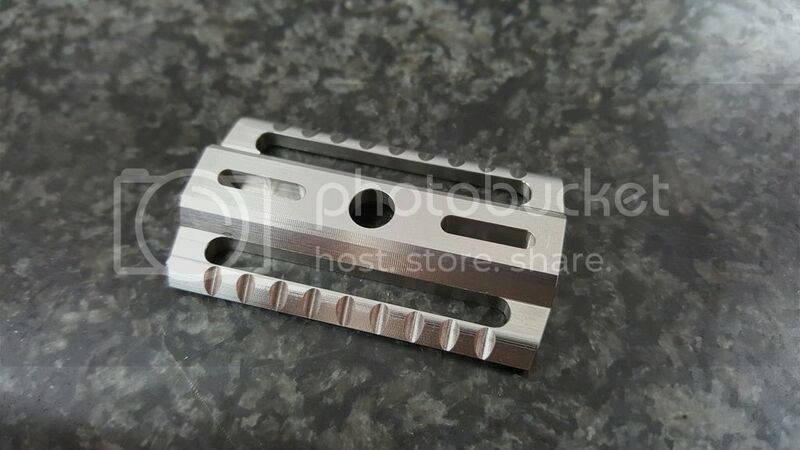 The Blackbird is a machined stainless steel razor. Shane told me that the prototype I have has is nearly identical to the production specs. 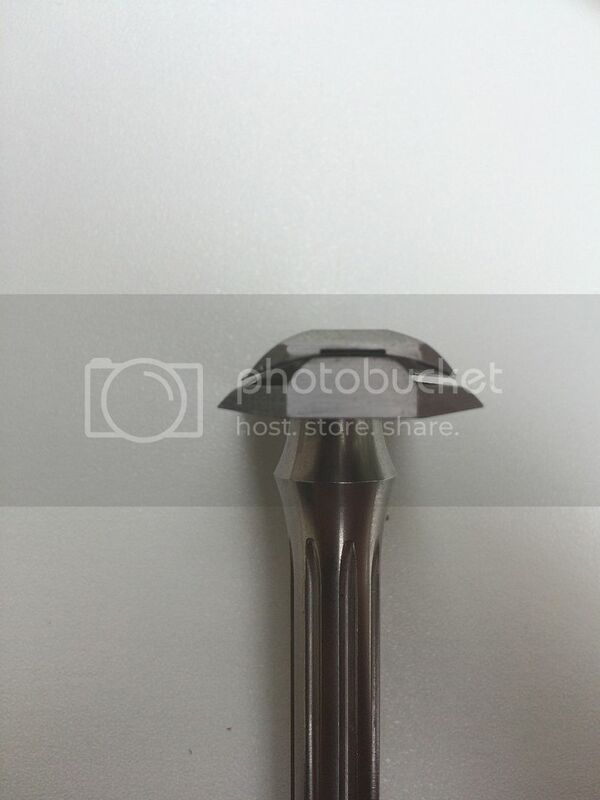 You can see in the two pictures above that the handle is designed to "slot" into the head, which is interesting. It creates a really solid, sturdy connection between the handle and head. 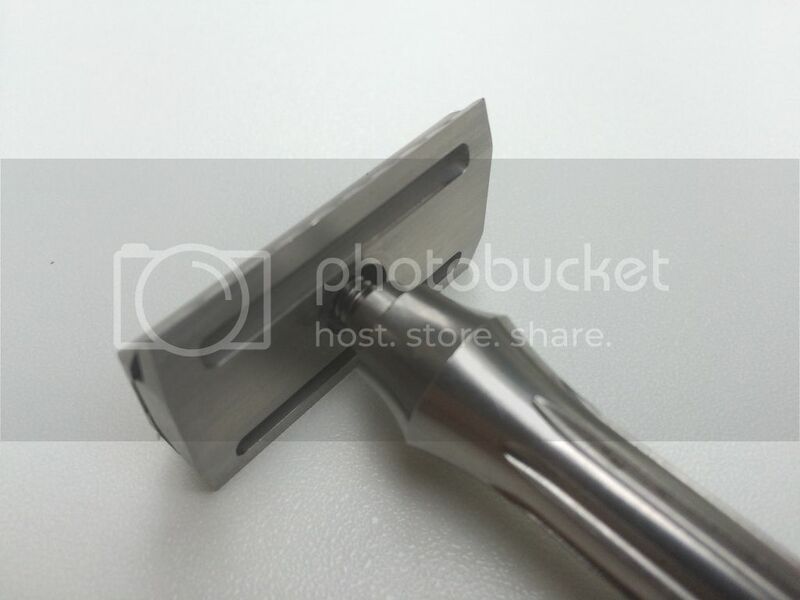 The head uses standard M5x0.8 threading, and the "slot" is pretty small, so you should still be able to use just about any after-market handle with the razor. And technically, you could use the handle with any other standard head, but it would look odd. I was able to use most of my after-market handles with the Blackbird head, but the Blackbird handle, while functional, wouldn't really mix well with other heads. In terms of looks, the Blackbird distinguishes itself from other machined razors in the market. It really looks like Blackland went out of their way to make sure that the razor looks unique, and I think they've succeeded. Rather than the smooth, rounded lines of most other razors, the Blackbird evokes the feeling of the Lockheed SR-71 Blackbird, (which I don't think is a coincidence, given the name and all) with clean, sharp lines and angles. It really does look unique, and would be easily identifiable at a distance, because it doesn't look like most razors. Also, as a package, the lines of the handle very much compliment those of the head. While looks are nice, most of us are more concerned with the performance of a the razor. I will admit, I was skeptical at first. The Blackbird was originally advertised as a "mild" razor. If you look at the technical specs, the blade exposure and gap might seem to indicate "mild," because they are both relatively small. But when I shaved with the Blackbird, I don't think "mild" is a fair term to use. My stubble is extremely tough, and a traditionally "mild" razor, like a Gillette Tech, leaves quite a bit of stubble behind on me. The Blackbird, on the other hand, left my face feeling extremely smooth, and the smoothness lasted all day. I used it for about two weeks, with many different soaps, and a couple different blades. (Personna Lab Blues, Vokhshod, and Perma-Sharp) In fact, I will state that the quality of the shave was on-par with any of the stainless razors I've tried before. My main rotation consists of the BBS-1, Wolfman, King Cobra and the Black Mamba. 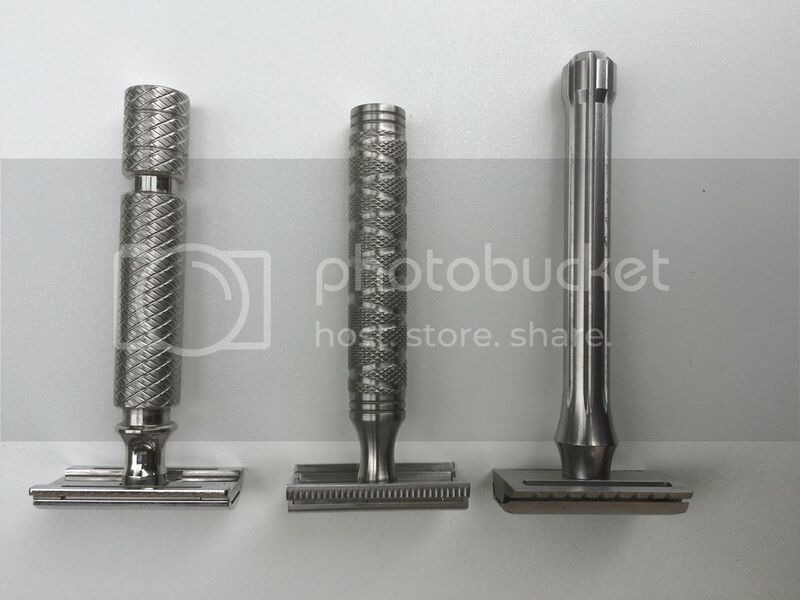 I sincerely believe that the Blackbird is in the same league as all of these razors, and I don't say that lightly. What I'm not sure about are the mechanics of how this razor seems to shave so well. In terms of raw blade exposure, you can see from the pictures that it doesn't have a lot showing. However, I would compare the way the blade is exposed to something akin to a wood planer. Only a tiny bit of blade is sticks out, but that tiny bit is all that's necessary to shave off the stubble. I also think that the Blackbird, and indeed many of the new crop of machined stainless steel razors, is that they have such tight tolerances that the blade doesn't flex at all when shaving. Because there is no potential for chatter, I got very few nicks or cuts when using the Blackbird. So while the head geometry is very, very different from the BBS-1, I found the two of them to have very similar quality of shave. The "aggression" of how much the blade interacted with my face seemed about the same on the two of them, and in stark contrast to something like a Gillette Tech, where the blade barely touches the face. I did find a few faults with the razor, and I'm hopeful that it's something that is fixed in the final shipping version. 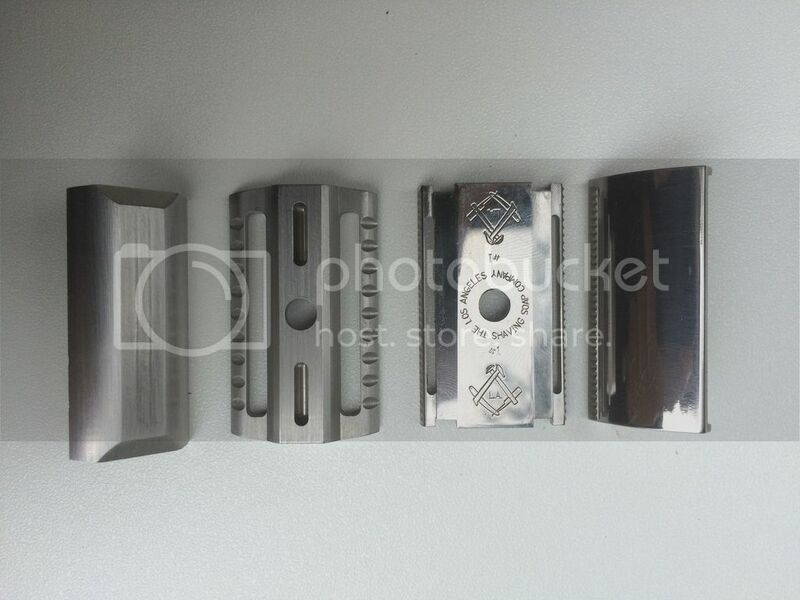 Firstly, the razor is very angular. So much so that the edge of the razor (witout a blade loaded) felt a little sharp. Not sharp enough to shave with, but I think it made the razor feel less smooth than it would have otherwise. Shane told me that he also noticed this particular concern, and that the edge has been rounded in the final production version. If the razor I used were my razor, I would probably have taken some very fine grit sandpaper and carefully rounded the edge just a little. I'm pretty confident that would have resolved the problem completely, and Shane said that's essentially what the machinist was doing (albeit with a mill, not sandpaper) on the production run. The other thing I'm not completely in love with is the handle. It certainly isn't a bad handle, and the grooves in the handle do a good job of keeping the water from making things slippery. But I tend to prefer a good sharp knurling on my handles. When I get the shipping version of the razor, I'll give the handle another try, but there's probably a good chance I'll end up using an after-market handle. That shouldn't count as too much of a slight, because I use after-market handles on all of my razors. As I mentioned above, they'll be available in a "raw" satin finish, and a black oxide, which I don't think has ever been used on a razor. I haven't seen the black oxide version, but there are some pictures on the website, and I think it looks pretty sharp. (No pun intended!) It should be noted that black oxide is not a coating like DLC or Cerakote, but rather a process that oxidizes the outer layer of the metal. It has very little to no thickness, and I'm told that it will naturally develop a bit of a patina with regular use. I looked it up, and it seems to be used on firearms with some regularity, and seems to be pretty durable. 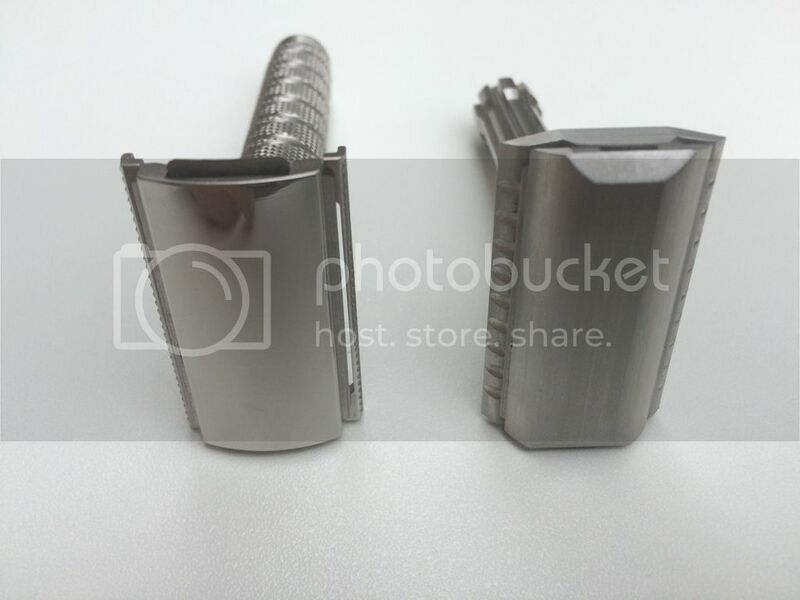 Finally, I wanted to bring up the Achilles heel of machined stainless steel razors, namely the difficulty in getting them in the hands of people who want them in a timely manner. 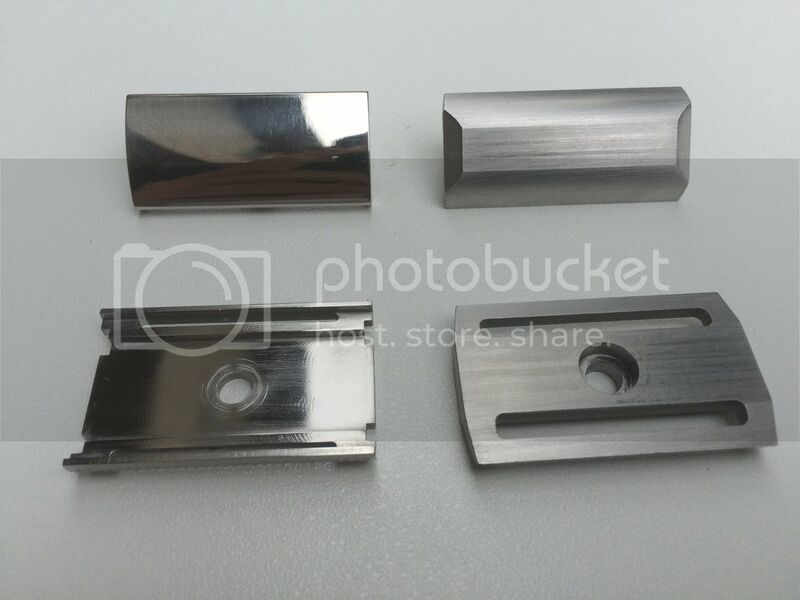 The machining process does not scale like other manufacturing methods, so making 1000 of them takes approximately 1000 times longer than making one of them. 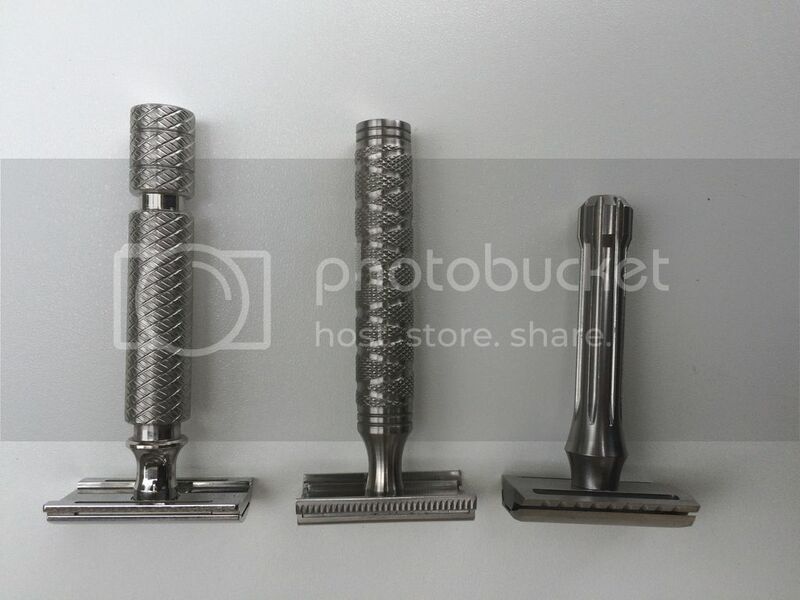 The only current machined razor vendor who seems to have worked out this problem is Above The Tie. I have no way of knowing whether supply will be a problem for Blackbird, but I do sincerely believe that if they can figure out how to address it, the Blackbird will have a huge impact on the market. I may get a chance to borrow the razor again before the final version ships, and if I do get that chance, I'll take some time and post some more, and hopefully better, pictures. I have a reasonably good SLR digital camera, but I recently moved, and couldn't find it before I had to give Shane his razor back. If you're still reading, congratulations, you made it to the end! Sorry for the length of my comments. I talk a lot, and I type fast, which is an especially dangerous combination online. As far as I know, I'm one of only a handful people who have tried one of these razors out, and I wanted to be as thorough as I can, for the benefit of my wet shaving brethren. If you have any questions, I'll try to keep an eye on this thread, and you can feel free to PM me at any time. I'm hoping to spur discussion, because if there's one thing we razor geeks love to do, it's sitting around speculating about things waiting for them to arrive. Very nice review ! Thanks for sharing your thoughts ! (11-11-2015, 02:42 PM)happydaze Wrote: Nicely written Craig, as always. Next time include your phone number so everyone's significant others know where to go with their bitching. Maybe I'll post Mrs chamm's cell phone number, so they can all commiserate about our addiction obsession hobby. If that is the case, I'll remove it, but why would it be prohibited? Hey guys! Just popping in to make myself available to any questions or concerns. It's been really great to meet Craig(and borrow from his ridiculous razor collection) and I'm thrilled and honored that you think so highly of the Blackbird. Craig is the razor available for purchase to the public? Depending on the timing of your questions, it may be related to how the razor came into existence. I did mention this to Ravi prior to posting, and did get an approval to post, though. It's available for pre-order on a "regular" website. The black land wasn't banned from the discussion board it's any talk about kick starter in general. It's in the terms and conditions of kick starter that they don't actually have to provide you with a product despite the fact that they offer you one in exchange for a pledge. Some people do not agree with this. If he has one for sale on a private web page I do not think TSN will have any problem with this. (11-11-2015, 03:17 PM)NSmalls Wrote: The black land wasn't banned from the discussion board it's any talk about kick starter in general. It's in the terms and conditions of kick starter that they don't actually have to provide you with a product despite the fact that they offer you one in exchange for a pledge. Some people do not agree with this. If he has one for sale on a private web page I do not think TSN will have any problem with this. That's definitely what I was alluding to. The crowd funding campaign ended months ago, and the purchases now are pre-orders, not speculation. (11-11-2015, 02:50 PM)chamm Wrote: If that is the case, I'll remove it, but why would it be prohibited? Thank you for clarifying, if it's available on an actual website that sounds good. (11-11-2015, 02:54 PM)ShaneS Wrote: Hey guys! Just popping in to make myself available to any questions or concerns. It's been really great to meet Craig(and borrow from his ridiculous razor collection) and I'm thrilled and honored that you think so highly of the Blackbird. Hi Shane, good to see you here. That's great new !! I was wondering about this razor months ago. Thanks for sharing the picture and details Craig !! An inkwell would be really cool. It's something I toyed with, but I think the larger diameter at the end of the handle may make it difficult to do well. I would love to see you pull it off, though! The base of the handle is 8mm in diameter which quickly increases to 13mm and then back down to 11mm for the main shaft. The curved "neck" area is 15mm in diameter. When I get back to my pc either tonight or tomorrow morning I'll get you a drawing with the dimensions. No such thing as too much variety IMO Best of Luck Shane! !